On August 7th 2010 Christa organized a Zumbathon for a family friend in her home town of Marshall Michigan. With the help and support of an entire community we were able to raise over $17,000. Below is the amazing, heart warming story. She wrote the Zumba home office and received an awesome personal response. My name is Christa South and I am a Chicago Zin and a god friend of ZES Debbie Wood. 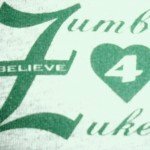 I wanted to tell you a story about my first Zumbathon, how it effected a community and raised over $17,000 for a dear family friend. I can’t thank Zumba enough for giving the gift of Zumba. For the first time in my life, with the support of my home town community, I was able to give a gift that will change a families life. In 2006 a friend of mine, Ben Zuehlke, who I grew up with contracted a rare form of Acute Disseminated Encephalomeletis A.D.E.M. he was 25. Less than 100 cases have been reported since 2006. At the time he and his wife had a new born. He had a stroke and was paralyzed. After a year of rehab he was able to go back to work. He and his wife decided to try for another baby. When she was 6 months pregnant the blood disease hit again, this time on the other half of his brain. He is now paralyzed and is unable to recover because the side of his brain that controls all of his motor skills has been affected. He is pretty much trapped in his body 🙁 He recognizes you but is unable to speak. He was unable to go to the birth of his second daughter because he is in a nursing home. They were able to skype the birth to him, and I was told he cried the entire time. I called his mom a month ago and said I wanted to help and I think a Zumbathon would be a fun way to raise some money for the family. She wasn’t sure what a Zumbathon was but was very touched that I wanted to help the family. I planned it for this past weekend because it was my ten year class reunion. I figured a lot of our friends and classmate who Ben and I grew up with would be in town. I contacted a few people to organize the event and it exploded! Before I knew it my mom was calling me about flyers, a news paper article and Tshirt designs that say “Every step matters, Zumba for Zuke”! My Dad said I created an avalanche. Then 2 weeks before the Zumbathon there was a small oil spill in my town. The oil leaked into a swamp, a creek and made its way to the Kalamazoo river which leads to Lake Michigan. The entire town smelled like gas and many streets were closed down. The families who owned homes along the river and near the swamp were evacuated from their homes because they feared their water was contaminated. Of course Bens parents home and their 200 acres contained the swampy land where the oiled leaked. They were evacuated from their home and unable to return until September. The night before the Zumbathon the oil company visited the Zuehlke Family and gave them a letter which said they would match up to $5000 of the Zumbathon’s donations! The family was so grateful. They thought the oil company was very generous but that did not prepare them for the generosity of the community. The next morning there were about 150 friends and families who attended the event. Together we raised about $12,000 for a grand total of $17,000. The total amount continues to grow as people in town hand my mother money for the family! Looking into the crowd of the participants I saw so many faces from my past. It was amazing to see the support system a small town has for one of it’s own sons. Even if some of the men did not participate they were there tapping there toes in support. I was told the event was the most fun fund raiser anyone had ever been attended. It was full of energy and love! I invited a local Zumba teacher to teach with me and I hope it inspired new people to join her classes. Ben took his first car ride home in over 6 months. Just knowing Ben was in town felt amazing and many of us were able to visit him at his Grandma’s home. It was the first time I saw him since the attack and it was really hard. Since he is unable to work, I hope the money is put towards a college fund for his daughters. Again I just wanted to thank Zumba for creating an amazing program. Not only does it encourage us to live healthier life styles but it has the power to inspire so many people in just an hour. Thank you Zumba…thank you. This story is amazing! YOU are amazing! Alberto and I (and the whole Home Office) feel privileged to work for people like you. I say we work for you, because we consider it our job to give you the tools that you need so you can go out and change the world. This is why we wake up in the mornings. You have inspired us at the office. Thank you for making a difference.